At our medical office, we offer medical grade micro-needling which allows us to go deeper into the skin resulting in collagen growth. 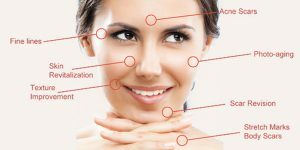 During your treatment, a cocktail of skincare products contains growth factors and vitamin C will be infused into your skin resulting in a dewy youthful glow. Patients are comfortable during their micro-needling session. Downtime for this treatment is minimal and safe for all skin tones. Treatment time is about 45 minutes. Results are apparent within the first few weeks. Micro-needling can be repeated every 6 weeks depending on your concerns. To help your results last longer. During your consultation with Dr. Chaudhary, she will advise a skin care routine for you to use at home to give you long-lasting results. PRP therapy involves the infusion of your plasma which contains high levels of platelets, growth factors all of which result in collagen growth. This is the treatment of choice for many celebrities wanting a beautiful complexion. During your consultation with Dr. Chaudhary, she will recommend if this is an appropriate treatment for you.